Weather has been all the talk this past winter with an unusual amount of snow storms in the East and the Pacific Northwest has little or no snow but the Skagit Valley farmers are loving it. 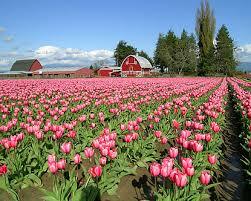 Each spring in the Skagit Valley, located just 75 miles north of The Guest House Bed & Breakfast, you will find fertile soil and fields of breathtaking blooming tulips and daffodils. 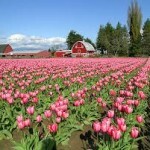 With our usual warm weather mother nature stepped in and the daffodils are in full bloom now and the tulips will be blooming before the end of March.The Skagit Valley Tulip Festival celebration is April 1 – 30th but the earlier in the month you attend the better blooms you will encounter.